In November of 2007, the Department of Education formed a new group, the Teacher Performance Unit (TPU); a team of five lawyers and consultants who were tasked with the job removing teachers that the department identified as ‘bad’. At that time, Dan Wesier, the chief labor relations officer for the DOE was quoted as saying that the TPU would “…ensure we have the capacity to seek the removal of all ineffective tenured teachers..”. He also said that the new team would “… also allow us to seek discipline where appropriate in a wider range of cases than before..”. Former UFT president Randi Weingarten responded to the formation of this group by asserting that the DOE was “.. relying on an unnecessarily punitive and counterproductive management style that is intended to create a climate of fear, rather than collaboration, in our city schools.” She lead a candlelight vigil on the 27th of that month to protest the group’s forming. Six years, and a brutal recession, have passed since this policy initiative was launched. During this time, the ranks of lawyers who work for the TPU, and it’s sister group, the Administrative Trials Unit (ATU) have swelled, while many of us who teach in New York City’s classrooms have witnessed the numerous attempts to fire our colleagues, many for reasons that we can only be described as frivolous and petty . The Movement of Rank and File Educators believes that it is time to begin examining how many teachers have lost or have been forced from their jobs by the department since this policy began. This, to be clear, is no easy task. Anyone who knows anything about the process of firing teachers in New York knows that much of that process is kept secret. Some of this secretiveness is by statute. The state law that governs the process, 3020-a, guarantees an accused teacher his or her confidentiality throughout the entire process (unless he or she chooses to have its proceedings made public). And some of this secrecy is because the DOE and the union have both agreed to keep the actual numbers -the specific amount of people who have been put through this process- secret. The resulting fact is that there is no data that tells people how many tenured teachers lost their job in New York City in any given year. As a consequence, no one actually knows how many teachers the city has fired, or even how many it has tried to fire since the formation of what Weingarten termed the ‘Gotcha Squad’. There are guesses and nuggets and tidbits of information that has surfaced from time to time. But there is no real hard number that anyone can point to. This number could be ten or it could be ten thousand and none of us would know. The first step in finding out is to examine exactly how much money was spent since these years in the pursuit of firing teachers. It is, of course, is impossible to track every dollar that has been spent pursuing 3020-a charges of tenured teachers. The school district who decides to fire a teacher pays much of this expense. It is responsible for any investigation related or leading to its decision to begin a 3020-a proceeding. It must also provide a venue where the hearing can occur, a place where that teacher will report to work while he or she is suspended and don’t forget the salary of a replacement teacher during the time of the suspension. Most importantly, the district must pay the fees of the lawyer(s) who will try the case. The state teacher union (NYSUT) is, when a member so decides, responsible for the fees representing the teacher during his or her defense. It is simply not possible for us to account for all of the money has been spent. So tracking how much money is spent on trying to fire teachers isn’t so difficult after all: We must simply examine how much money is spent on the fees for hearing officers in any given year from the state’s Tenured Teacher Hearings Fund. If NYSED was compelled to spend more from this fund than usual, then we know that school districts in New York tried to fire more teachers than usual. In New York State, the fiscal year ends on March 31. So, in any given year, any money that the state has spent through this date (called “actual expenditures”), and in NYSED’s case, any money that is earmarked to be spent through the rest of the school year (called “projected expenditures”) is reflected in the monthly fiscal report for March of that year. It isn’t difficult to see that, beginning FY 2008/2009, and continuing through FY ’11/’12, there was a significant increase in spending from this fund on fees for 3020-a hearing officers. The only conclusion that can be drawn is that during, and just before, this period of time, hearing officers -who’s only job is hear the 3020-a hearings of teachers who were in the process of being fired by their district- were presiding over a great many 3020-a cases -many more than usual. So much, in fact, that the fund ran in deficit. 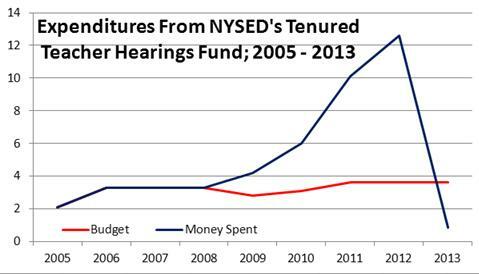 During these years, more money was spent on fees for hearings officers and court reporters than NYSED or the state legislature had anticipated. You’ll also note an increase in spending from this fund just two years after the formation of the ‘gotcha squad’ of at least $2 million each year. In 2007, with New York City’s Rubber Rooms still open, it took approximately that long to bring a teacher to trial. While some of this money is, indeed, carry over debt from previous year, an examination of the budget reports will show you that new money -at times at an alarming rate- was spent from this fund during the subsequent four years. Just another look at the line graph depicting expenditures from this fund. We now know that more teachers experienced the 3020-a termination process during these years than ever had before. While we hesitate to guess the amount of teachers, we anticipate that this number must be staggering. That money, however, reflects 3020-a hearings from all across the state, not only here in New York City. In order to show that the lion’s share of this money was spent firing city teachers, it’s important to separate New York City’s expenditures from the Tenured Teacher Hearings Fund from the rest of the state’s 694 school districts. Fortunately, there is a way to do that. The number he sites reflects only those teachers who were charged, who chose the free legal defense from NYSUT (a great number of teachers opt to hire their own private defense attorney) and who’s charges were not settled before the hearing concluded. Anecdotaly , we know that the overwhelming majority of charges filed end up in settlement. A settlement is an agreement entered into between the department and the teacher who has been charged whereby the teacher agrees to some type of penalty. In the past, this penalty has included a letter to file, a course (that the teacher must pay for) and in many settled cases, a monetary fine that is deducted from the teacher’s pay over a series of months. The numbers Mr. Pallota cites represent the smallest fraction of teachers who have been charge: Those who were charged, were not offered (or didn’t accept) a settlement and did not opt for private attorney representation, instead choosing the services that NYSUT offers. However, using this number, which we have no reason to doubt, we are able to estimate that approximately 208 teachers outsideof New York City experienced this process through it’s entirety (with NYSUT representation) between September of 2009 June of 2010. That’s 561 cases (counting the backlogged cases that lead to the famous April, 2010 agreement to end the rubber rooms and speed up the process) that were handled by NYSUT attorneys within New York City. We can now see that, according to NYSUT, 353 more teachers cases were handled by NYSUT inside New York City during the same period of time. We can now see that between the years of 2009 and 2012 New York City spent the lion’s share of $32.8 million in state funds, running the state into a $19.7 million deficit in the process, to dutifully try to fire more than four times the amount of teachers as anywhere else in the state. Only two possible conclusions can be drawn from this realization: Either an astoundingly high amount of teachers here in the city are bad, or our employer, the city’s Department of Education, has zealously pursued a course to fire as many teachers as it can. We believe the latter: That, instead of spending badly needed money on children and on schools during the depths of the recession, the department engaged in a zealous attempt to fire as many teachers as possible and used the state’s money -more than $19 million of which it did not have- to prosecute those attempts. We also believe this policy continues to today. Former president Weingarten’s prediction was correct; the DOE has created a climate of fear and intimidation in our schools. This climate of fear has had an adverse effect on the working conditions of our colleagues and must end. We must establish an open environment of collaboration if we expect our teachers to excel. In addition, the department must direct as much money as possible to the actual classroom -to actual students- instead of using it in an attempt to fire teachers (at a rate at almost five times as frequent as other districts throughout the state) if they expect their schools -our schools- to be successful. Well said Norm. The NY Teacher is great for great teacher stories and pictures of Mulgrew, but truth about attacks are never posted. Unity-UFT won’t do it but MORE-UFT should. This is an outstanding analysis and the kind of methodical investigative journalism that the media OUGHT to be doing in regard to this particular city agency but will not. Ergo… is there any alternative other than that MORE…as one of its multiple roles ( in this case, as “citizen watchdog group”) … fill that particular void? Food for thought, certainly. And further discussion, I hope. Can you imagine the cost that would go into my 3020-a in addition the the countless dollars spent just in my reassignment and investigations?